Sho-Me Flooring offers the best Carpet Cleaning in Branson. Sho-Me Flooring is always trying to bring you the best service for a reasonable price. Our carpet cleaning system is considered one of the best systems for carpet cleaning. We have added ceramic tile cleaning, porcelain tile cleaning, natural stone cleaning, concrete cleaning, plus many more hard surfaces cleaning to our list of services. Don't like the way your grout looks? We can help you fix that dingy grout. Ask about our HVAC duct cleaning. How clean is the air you breathe? Get longer life out of your investment. Regular scheduled carpet cleanings can help prevent stains like the stain on the left from developing. Left untreated these stains can damage the fibers of your carpet which can not be repaired. 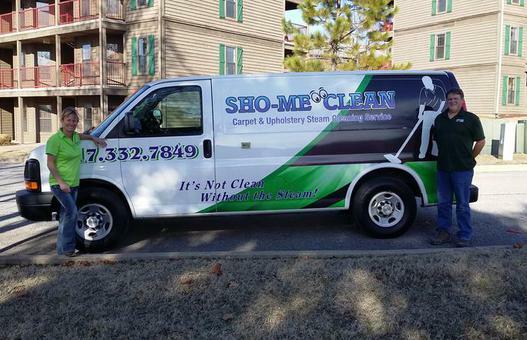 For information on Carpet Steam Cleaning and other services offered by Sho-Me Clean, check out our website on the link below. This site is dedicated to our carpet cleaning services. Sho-Me Clean is certified in water restoration and water removal through IICRC (Institution of Inspection Cleaning and Restoration Certification). IICRC is the organization that teaches, trains, and certifies technicians on the proper way of water restoration and extraction. The course includes classroom, hands-on training, the proper understanding of moisture readings, the proper use of equipment, and how to apply these skills to help limit the water damage and monetary loss due to flooding. Not every water removal and restoration is the same. However, the IICRC gives us the proven skills to help you during your time of high stress and the loss of your possessions. Water DAMAGE can happen at anytime, therefore, Sho-Me Clean is available twenty four hours a day (24 HOURS) to respond to a water removal emergency at your home or business.